This beautiful flower picture was taken by the same person who photographed the magical mandrake that I wrote about earlier this week. 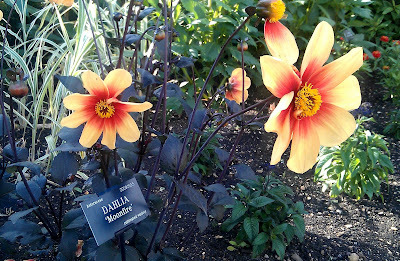 It shows a stunning dahlia called "Moonfire", which sounds a very witchy name and was seen in Oxford Botanical Gardens. In the language of flowers, the gift of a dahlia means good taste. However, if you are giving a floral present to a loved one you should only give a single dahlia bloom as to give big bunch indicates instability. The photograph is copyright the photographer and should not be reproduced without permission.